Sarah Bear Crafts: All the Tote Bags. Recently my friend Alex posted about CARROT, the "to-do list with an attitude", and I succumbed. I too must admit that empty points from an app instead of the inherent joy of a job well done. Because of CARROT's empty points, I've found everyone's addresses and wrote them by hand on our wedding invitations. Because the printable labels for the return address have't arrived, I thought I'd tackle something else on the list: sort through and clean all tote bags. What is it with tote-bags and being a knitter? Once a project is done, do I diligently return the yarn to my stash? Oh no. It stays in the bag. 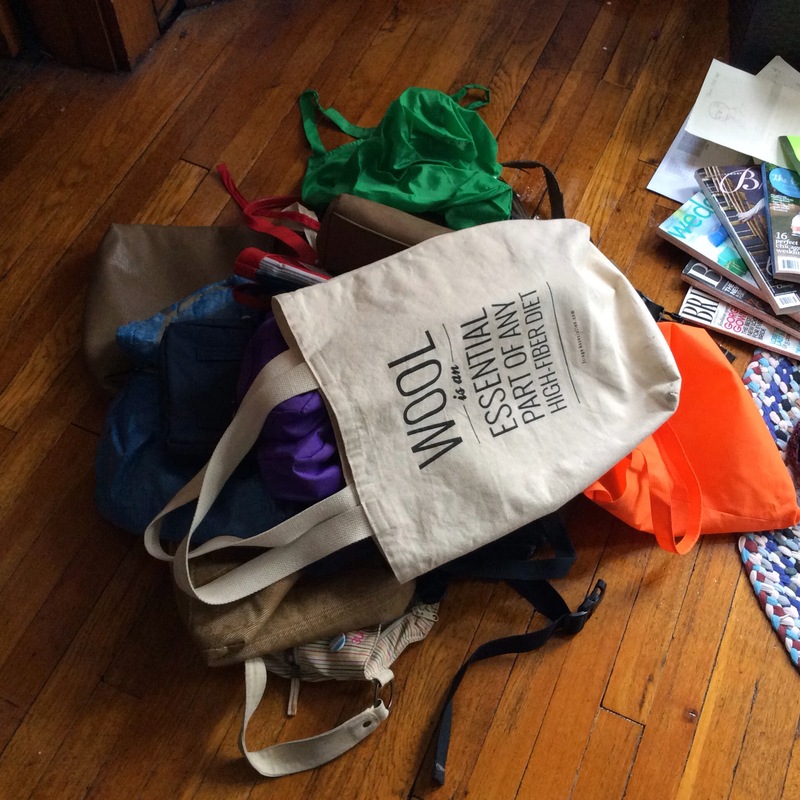 Eventually when the bag gets too full of scraps, it leaves rotation (translation: new tote-bag) along with all the receipts, lotion tubes, pens and pencils, notebooks, and magazines. Even, in the case of one tote-bag, other tote-bags. So I did it! I went through all the tote-bags, purses, and back-packs! Want to see? I knew you did! That's a lot of bags! I saved the best for last--my new Wool bag from my friend Grace. The cloth bags are all going straight into the laundry. I'm going to add that as a task on CARROT, now! Top left: Wedding magazines, books, pattern notes. Top center: Yarn! And all the stitch-markers and yarn needles in existence. Top right: receipts, wrappers, and other trash (even found some loose staples in my back-pack, back when I had a stapler about 3 years ago?). Middle right: ball bands, toiletries, office supplies, stickers, loose change. Bottom left: Anna Vogelzang and Neko Case CDs, and some loose shawls. What a mess! 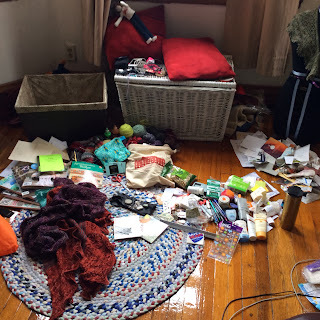 Oh well, now I know what I have, it should be fairly easy to put away (toiletries go to the bathroom, yarn goes in the stash, wedding magazines...meh, they get recycled because after you've read one, you've read them all!